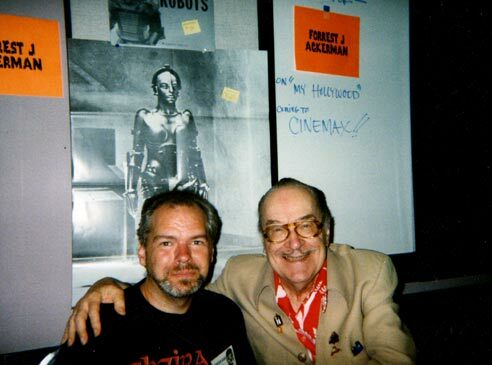 What an honor it was for me to have met Forrest J. Ackerman at your shows over the years. I was lucky enough to have my photo in Fang Mail (FM #120), as a Monster of the Month in the Graveyard Examiner (FM #157) and a letter (about the assassination of John Lennon) printed in FM #174. I even called the man once when I was a kid after finding his number (1-666-Moonfan if I'm not mistaken) printed somewhere and he took my call!!! We talked for a few minutes and I was in monster kid heaven for... well... til this very day. 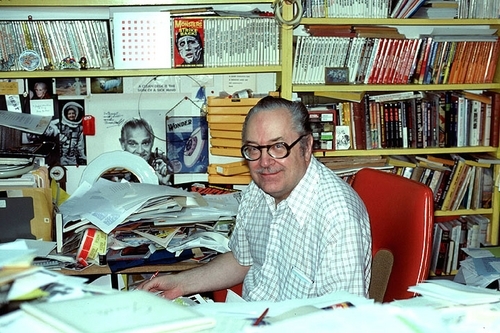 My love of cinema, art, literature and comics sprung forth from this man's magazine. To have had the honor of meeting him a few times was the icing on the cake and I could never have done such a thing without you and your great show. I'm heart-broken, to just now hear this sad news. God love you, Uncle "Forry"! Your "Fiend", David "The ROCK" Nelson, a.k.a. "ROCK Monsta"! I-"ROCK" just got this message from Universal Monster Army 18 minutes ago. It read: New announcement: Dear God No! R.I.P Uncle Forry! I saw it here at the radio station at 4pm. We've lost a true legend, and a dear friend. 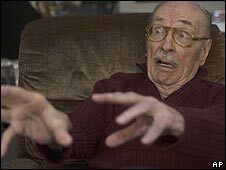 I just glanced at your Website and read the news about Forest J. Ackerman. I want to offer my condolence to his Family and Friends. He was a Friend to us all. We all grew up with Uncle Forry. He was Major Voice in our Industry and an inspiration to everyone of us. 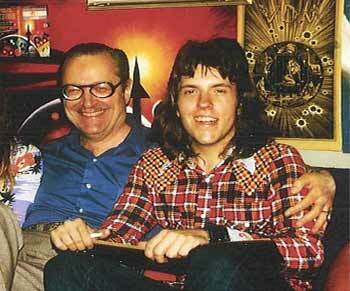 I met him once in San Jose, California in February 1979 at The San Jose Fantasy Symposium. I was 15 years old at the time. What a nice man! 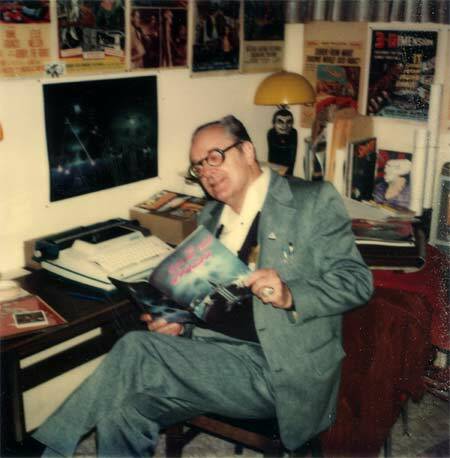 Above: Bill Edwards with a few FM #1s....a magazine edited by Forrest Ackerman. 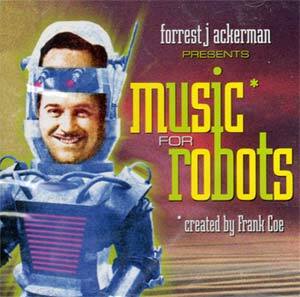 Someone asked me if Uncle Forry died of natural causes, which I replied, "SCIFI causes". I'm sure it should be recorded somewhere as dying at MIDNIGHT THE WITCHING HOUR! I will always miss his puns. Rest in peace old friend.....-Bill "Drac" Edwards. Right now I would prefer to dwell on Forry's life and not his death. All our days are numbered......what we do with them is what defines us. Forry enjoyed his life and made a living doing what he loved most. Because of this he was able to take all that love for life and share it with us. Forry's passing is truly sad, but it's his life that in the long run will always inspire me. Ron thanks for giving me the oppurtunity to spend some quality time with this great man. -Michael A.
Click on the image above to get a tour of Forry's AckerMuseum in it's full glory! ITS A SAD SAD DAY IN MONSTER LAND, AS THE GREATEST MONSTER KID OF ALL HAS LEFT US. I KNEW THIS DAY WAS COMING SOON, BUT IT STILL IS A PAINFULL BLOW. BUT IM SURE ALL OF US WILL ALWAYS HAVE FOND MEMORIES OF MR. MONSTER. AND THE GREAT PUBLICATION HE LEFT FOR US TO ENJOY. THE GREAT OLD PHOTOS, STORIES, AND CORNY PUNS THAT MADE F.M. THE MAGAZINE WE KNOW AND LOVE. R.I.P. F.J.A. Bob and I were having breakfast with Forry in Ligonier, PA and somehow he got to telling the waitress about his "acting career." What it lead up to was how the parts were becoming few and far between , and the only part he could get last year "was a judge in "Nudist Colony of the Dead." He said it with shame and hung his head low (with tongue planted firmly in cheek) and just held it down like a disgraced man. Bob and I just laughed, but the waitress gave a very faint "oh my God" as her eyes opened wide and she slowly backed away from us, not knowing what to think. I can still see it as it happened and it still brings a smile to my face. -Mike A. 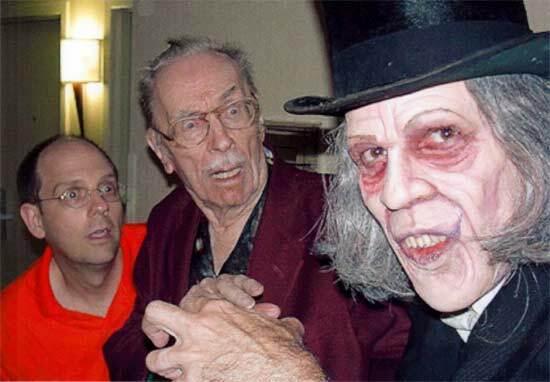 Above: Ron Adams, Forry Ackerman, and Kevin Slick as the London Vampire (make-up by Ron Chamberlain) wearing Lon Chaney Sr.'s hat from the movie LONDON AFTER MIDNIGHT. first time, or hear Lugosi intone the classic line "I never drink...wine"
shoulder. That way I can carry a little of him along with me forever. why I had thousands of children, simply thousands." Ron here are some pictures I took over the years. 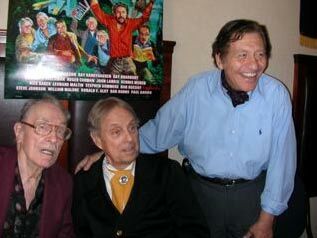 Forry was one of 3 people that gave me the love of classic horror films,along with my Mom and Bill Cardille. I remember the first time I met Forry. It was at the very first Monster Bash in 1997. 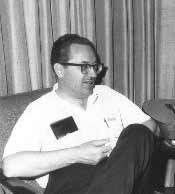 He was sitting in the lobby all by himself and I remember thinking, I can't just go up and talk to him...that's Forry Ackerman. Little did I know that over the next few years we'd become friends, thanks mostly to Joe Moe who would always say. Look Forry there's Barb. At the Winterfest in 2000 I won breakfast with Forry and he regaled me with stories and flirted shamelessly with the waitress. I am proud that I have a FM dedicated to me and that because of the Monster Bash, got to know this wonderful, pun-derful man. He'll be missed and never, never forgotten by all his nieces and nephews. 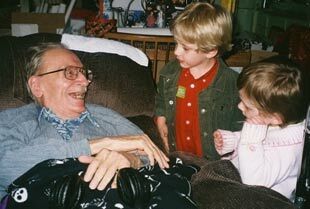 Thanks for the wonderful life "Uncle Forry" -Barb Heiss. 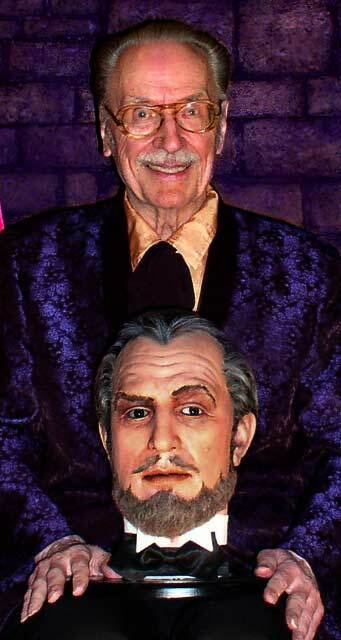 Above: Another photo from Cortladt Hull with Forry and Cortlandt Vincent Price "head!" Just got home from work and heard about Forry’s passing. Terribly sad news indeed. Probably no one I can think of united and influenced horror fans as much as Forry. I doubt so many of us “Monster Kids” would even know each other without Forry, probably because he was as much if not more of a fan than we are. Leave it to Forry to leave us right at the Witching Hour. I’m sure he’d have it no other way. So glad I got to meet him at the Bash, they are moments I’ll always remember. Thanks Ron. Above: 40 years and friends.....Left: 1966 Forry Ackerman and Cortlandt Hull. 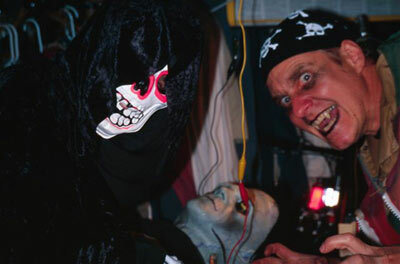 Right: 2006 Cortlandt Hull and Forry (Ron Chaney behind) at Monster Bash. and film. 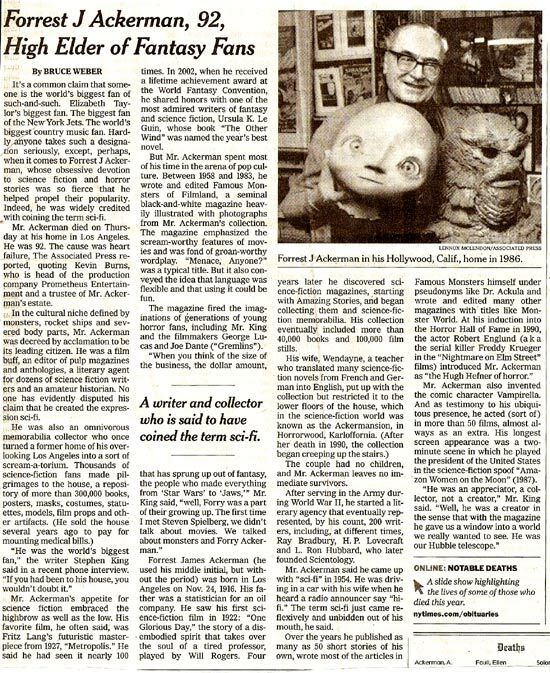 Long before the internet, he joined fantasy and horror fans together - to all of us, especially who grew up with "Famous Monsters", he will always be our "Uncle Forry". Thank you Ron, for bringing him to us, as often as he was able to travel. I was hoping Forry would enjoy one more Christmas. Yesterday, I received the reissue of FM #6 in the mail (with the Kong cover) that I won on ebay. I haven't read this issue since 1960. All my memories of that issue and my enjoyment of reading Forry's articles all came back to me. I bought FM from 1958 through the early 70's. I never thought I would meet Forry or see his Ackermansion. I was lucky to meet him, visit the mansion, and shared several meals with him and my family. I enjoyed seeing him every time he came to the Bash. He even let me try on Bela Lugosi's cape and ring. I feel as if a member of my own family has died. And in a sense, he was a member of every Monster Kid's family. He was our Uncle Forry. 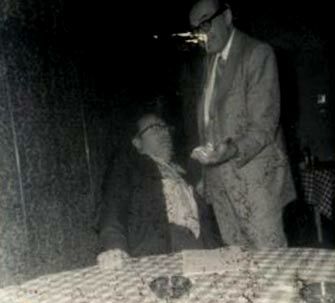 guiding hand of Forry Ackerman. Farewell, old friend. You did well. 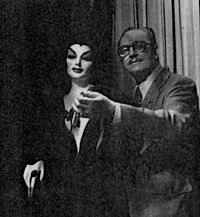 Above: Carroll Borland (MARK OF THE VAMPIRE) and Forry Ackerman. I'm saddened to hear about the passing of one of the king of the monster kids. 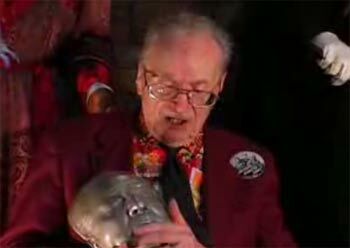 He was a pioneer, one of the founders of classic monsterdom. I've attached my own tribute to him. A photo of him, much younger. And yes, that IS Carroll Borland about to put the bite on him. This is how I'd like to remember him. 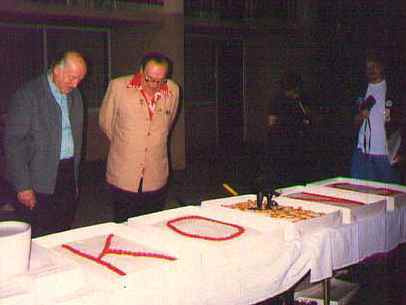 Above: Ray Harryhausen and Forry in front of GIANT Kong kakes at Monster Bash 1998. That's the Aurora model on the middle cake. 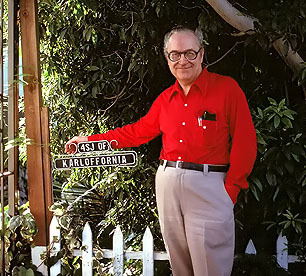 I'm a young (that's 23, folks) Horror and Science Fiction fan who is in love with Vintage cinema and the realms of the Fantastic.It is of great regret that I did not have the pleasure of ever speaking to Mr. Forest J.Ackerman, the man responsible for so many of us being fans of the kind of stuff that we enjoy. Few people in this field,have I had greater respect and admiration for.I shall be a defender of the faith, and continue my allegiance to our beloved genre, holding in my heart the wisdom and warmth of Uncle Forry. We all owe the great man a debt. 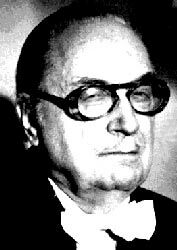 Thank you, Mr.Ackerman for making it possible to dream in such a dark place. 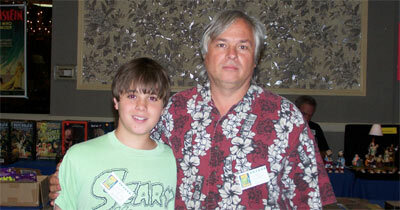 Above: Scary Monsters magazine Editor Dennis Druktenis and his son. Well, we all knew it was coming but I actually thought Forry was going to pull through once again after he began to hold on longer than expected. He made it to his 92nd birthday which I thought was nice. Scary Writer Debbie Painter carried my personal Beast Wishes to Forry to his home several weeks ago so that makes me feel a little better. When I found out the sad news yesterday afternoon I just had to stop working on the last 3 pages of our upcoming issue and remember Forry. Today, I will put the next SCARY issue to rest, a magazine that wouldn't have ever been possible without Forry and FAMOUS MONSTERS. 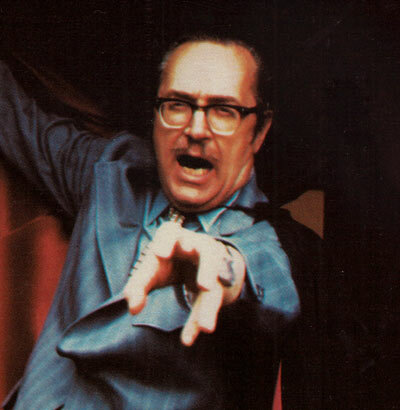 There's a lot more to say and I will say more in my introduction to SCARY MONSTERS #69 but I invite everyone to join in the Tribute to Forrest J Ackerman in SCARY MONSTERS #70. 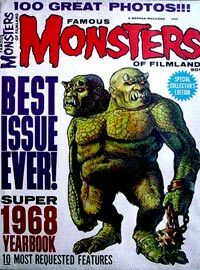 Send in your MONSTER MEMORIES, Tribute articles and photos by early February and I'll try to get in as many as possible into the SCARY 70th TRIBUTE ISSUE FROM THE BLACKY LAGOON! This issue will also feature Ben Chapman's last interview so it will be a double tribute issue! 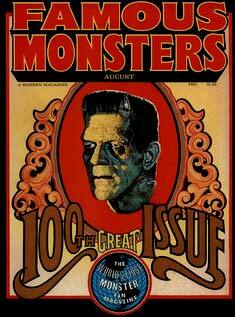 FM #100 was the first monster mag I ever bought. As a kid it was a thrill to see my letters printed in FM. I remember seeing my name in a feature FM used to run about identifying what movie a photo was from. 4E printed information about my Godzilla fan club in several FM issues (for free!). I met him at a Pittsburgh monster con in 1978. As I was leaving I saw him getting a shoe-shine. He was really a nice gentleman, we had a nice talk and he gave me his autograph (again, for free). Saw him years later at 2 monster bashes and he was always kind. Remember seeing him on 3 TV shows: a Tom Snyder Tomorrow episode (where he broke Peter Cushing up talking about X-rated monster movies! 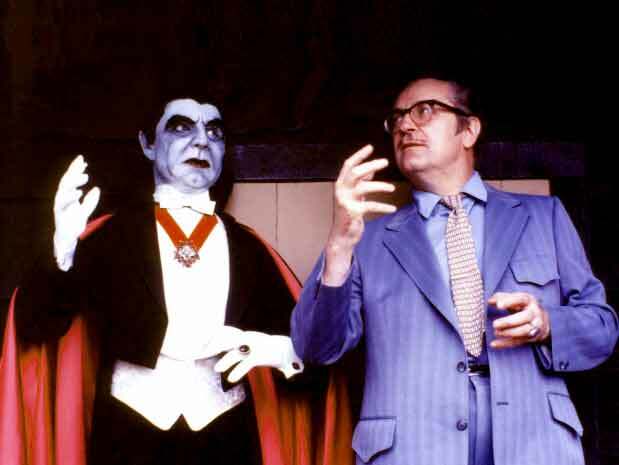 ); a Mike Douglas show (with Darren McGavin and Zacherle); and an ABC late-night special called "The Horror Hall Of Fame" (which included Vincent Price, Billy Van, John Astin, John Carradine, etc). I wish these were on DVD. 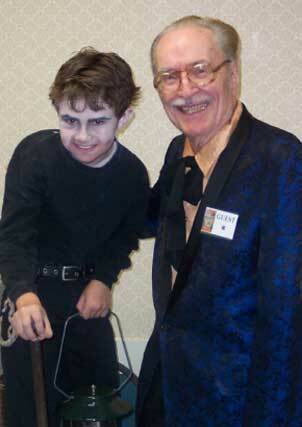 I'll miss him -- as well as Beverly Garland, who I also met at a monster bash; she was a nice lady. I'll never forget talking to her about Robert Horton's old TV show "A Man Called Shenandoah" (she was in the pilot). Best to you Ron - Richard Campbell. Thanks for all of your love and support of Forry over these many years. And thanks for always being there for me too! It has been such a privilege for me to be so close to Forry during some of the most trying times in his life. It has been incredibly rewarding. All of fandom kept our ol' guy going much longer than ever expected. Never long enough, tho. Together we'll have to figure out how to travel a world without Forry. 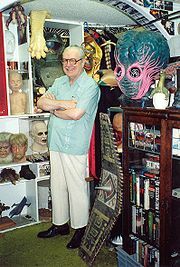 Memorabilia, magazines and memories aside, the most valuable thing Forrest J Ackerman ever gave us was...each other. Forry Ackerman shall not die! ABOVE: Past Saturday's New York Times sent in by Bruce Tinkel. It is a sad day indeed to know that Forry has passed on. He was truly and influence and inspiration to my life. When I was a kid, I would have to go to bed at 8 PM, but on Friday nights, my brothers would wake me up and we would watch Project Terror together on TV in San Antonio. 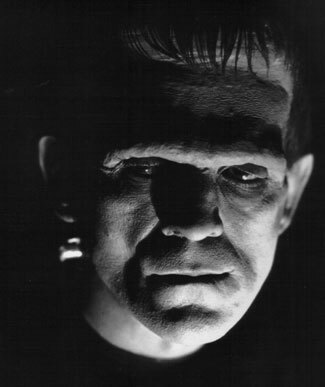 It was through that show that I learned about Frankenstein, Wolman Dracula et. al. 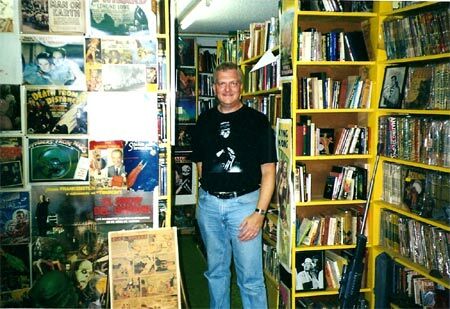 My first encounter with Famous Monsters (FM) was in a store in Eugene Or. I was seven years old, and FM 86 was out at the time. 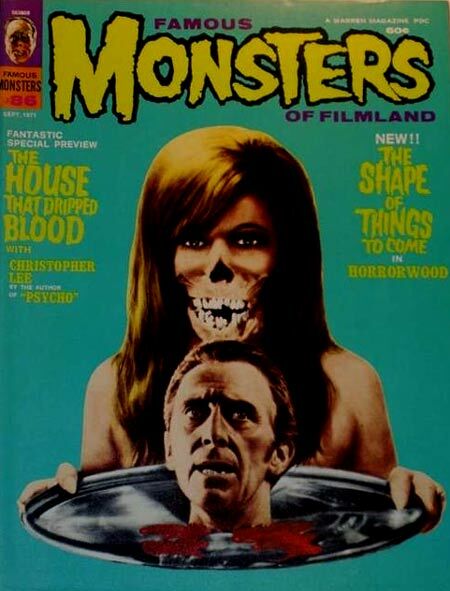 I will never forget seeing the cover, with a picture from the poster of The House That Dripped Blood. It scared the heck out of me, and I had nightmares for many years to come about that horrific image. It was one of the last issues that I added to my collection later, I was so frightened by that cover. It was 8 issues later that I purchased my first FM, #94. Its beautifully rendered cover with Karloff's Frankenstein Monster attracted my attention at a newstand, and I asked my aunt to buy it for me. I was hooked. I read it cover to cover and loved it. Later in elementary school, I met a friend who had FM 5, and we started a club, and when we could, we would buy the issues as they came out. Around the same time in Eugene, Cable TV started and we were able to get Channel 2 from San Francisco, so we were able to enjoy Chiller Theater Saturday afternoons, and Creature Features at night. The rest is history. 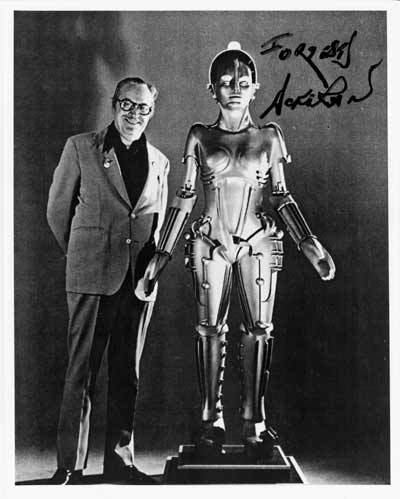 I had a chance to meet Forry when I was 14 years old in 1978. My mother had passed away, and my father and I took a road trip from Eugene, down to San Diego and then across the nation to Pennsylvania. My dad spoiled me, taking me to anywhere I wanted to go. 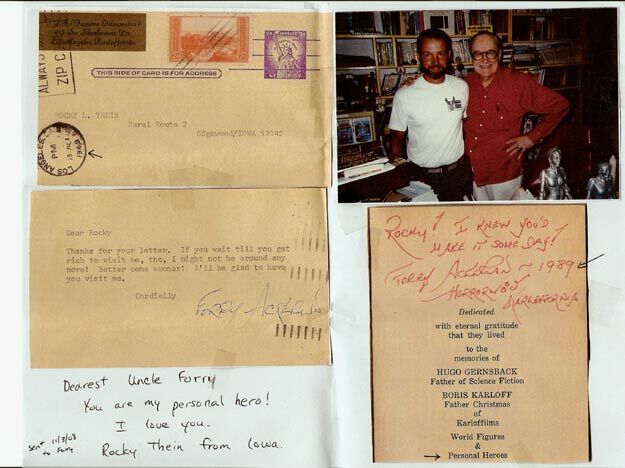 I sent a letter to Forry saying I would be in town, and he sent a card back saying I could visit when we were there. My dad and I found our way to the Ackermansion in Hollywood and had a tour. 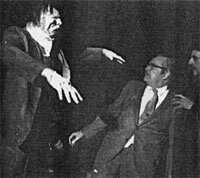 My dad and I will never forget his devilish welcome as he bellowed out "Who dares enter ..."
That same year Forry came to Pittsburgh for a convention in Monroeville. I met him again, and asked if he remembered me. He looked at me and said, "oh yes", looking at my buttons "You are the Harryhausen fan". To tell you the truth I was disapoinnted, as I realized he didn't remember me, but now I know that that happens. He was 62 then, and I am only 44 now, and the same thing happens to me. I forgive you for forgetting Forry, I understand it happens to all of us. More than the great magazines, great tour and influence in my life as a genre fan, what affected my life most about Forry was the warnings he gave in FM against smoking and drinking for young people. I don't remember exactly when or why, but I do remember that he was responsible for keeping me away from those vices. As I look back and remember, I always credit him for staying clean all of my life. Thank you Forry, for telling us kids about how bad those things are. 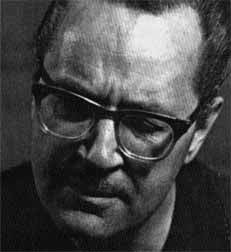 One thing that broke my heart about Forry, when I read his biography published years ago, was that he was an atheist. I am a Christian and when I read that it saddened me. I prayed for him, and believe that God in His mercy and love, had a big surprise for Forry the other day. I am not one of those dogmatic folks who will condemn him to hell. I believe God wants all to be saved, and one way or the other He is going to do it. I believe that about Forry too. He'll be surprised, but I think he will enjoy the new eternal fantasy life that awaits him. Thanks Creepy Classics, for allowing us to share our thoughts and tributes. I join with you in this time of grief, and rejoice in the memories that the Ackermonster gave us over the years. 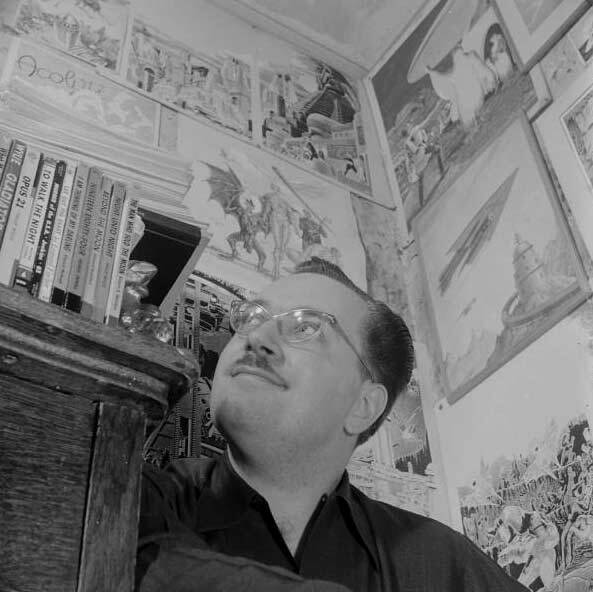 Forry has been a part of my life since my Mom bought me Famous Monsters #11 in February 1961. I was fortunate to have my request for a picture printed the "You Axed for It" section in issue #26. I first met Forry in 1974. He was everything I expected - friendly, funny and interested in what I had to say. My daughter, when she was young, would not let people she did not know come near her. When she met Forry, she walked up to him and held his hand. She said to me that "Forry is nice". This was a tribute to Forry's natural gentleness. 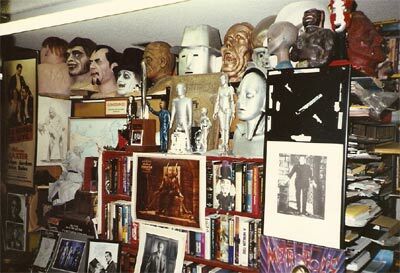 One of the greatest moments of my life was going to the Ackermansion in 2001. I went with Buddy Barnett, the editor of Cult Movies. 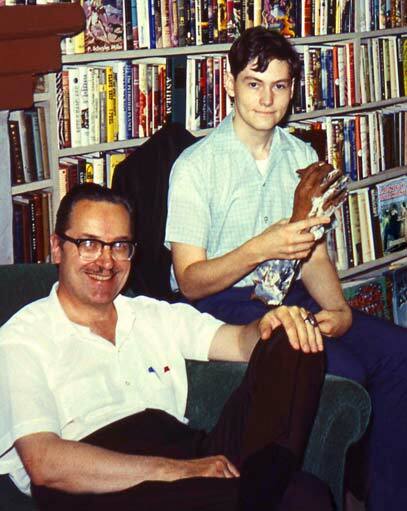 (See the attached pictures of Forry, Buddy and myself and me among Forry's huge book collection). I had been waiting for almost 40 years to go and to Forry so. He was touched and said, "What took you so long?". It was worth the wait. Every time I met Forry through the years, he always gave me a big hello and asked about my daughter. He has influenced my life in ways he never could have imagined. My love of horror films has guided me throughout the years and I have Forry to thank for this. He was a wonderful man and will be greatly missed. I have to tell you this story since it really makes me wonder just how connected we all are to each other. I was not aware that Forry had passed away until Sunday night when I finally was able to use my home computer (my teenage kids held it hostage until now) and read the news. Now, my first store bought FM magazine was the 1968 Yearbook edition (see photo). I must have read that magazine until the cover fell off. Well flash ahead over 35 years later and I'm at the Monster Bash with Forry as one of the guest. One of the venders had a copy of the '68 magazine which I quickly bought and had Forry sign. The magazine has been kept in plastic since that day. Now for the weird part. I'm cleaning up some of my personal possessions and I came across the magazine on Saturday afternoon. As I looked at his autograph and remembered Forry's comment that he never took a dime for his signature, I had an odd feeling that he was no longer with us. 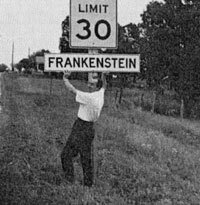 When I read the news Sunday night at Creepy Classics, I knew I had to tell someone. The world of Monster Kids is darker today but I am grateful that I had a chance to meet this man. Rest in peace, friend. 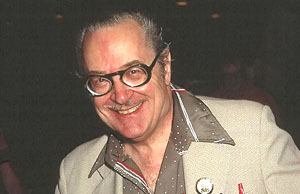 Above: Forry Ackerman at MONSTER BASH 2006. 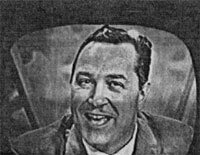 Click Image to see Cortlandt Hulland Dennis Vincent's great promo film of Forry! We just put together this sequence we shot of Forry at "Monster Bash". 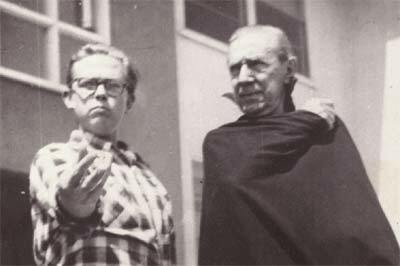 He talks about the Lugosi cape coat, the Dracula Ring, and "The Witch's Dungeon". He was in a great mood that day, we did not know what to expect, totally unrehearsed, he gave us a wonderful performance! We miss him already. Hope you enjoy it! 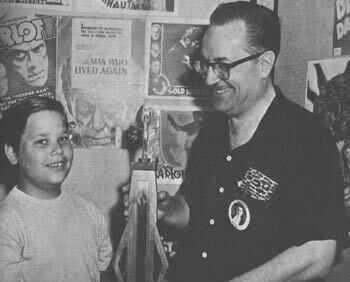 Above: Forry talks on TV about sci-fi in the 1970s and, right, our own "Gorespodent" here at Creepy Classics "Count Craigyla: and a kid. 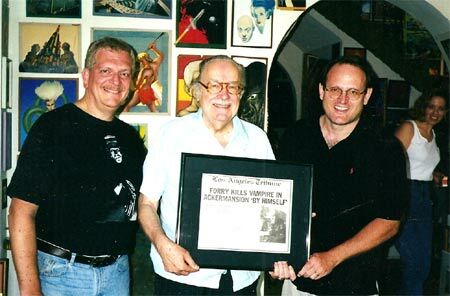 Forrest J Ackerman, Forrey, 4E, Forrest, Dr. Acula, a man with many names, he influenced countless people in oh so many ways, and no matter who (or what) you were, he always was more than generous with his time, if you asked him for it. He may have been 92 in people years, but if you spent any amount of time with him, you probably would have guessed him to be around 15 years old. 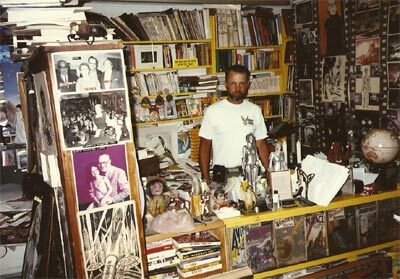 He welcomed both friends and strangers into his Ackermansion and heart without discrimination, and he always made each individual feel unique and special. 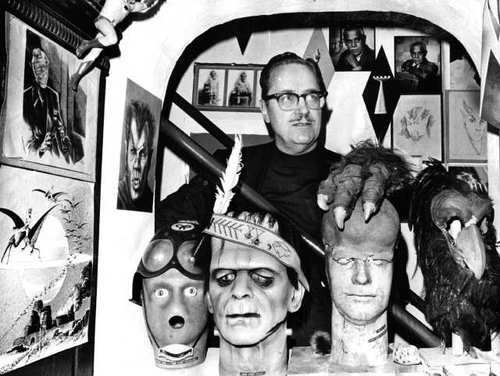 There is simply no enough web space on the Internet to describe what a truly outstanding individual Forrest J Ackerman is and was. We love you Forrest, and we will deeply miss you always. 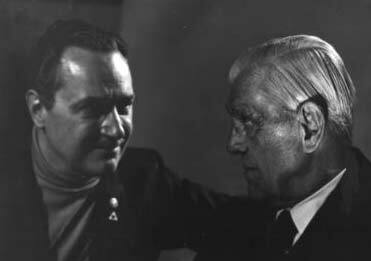 Above: Forry Ackerman and Boris Karloff. 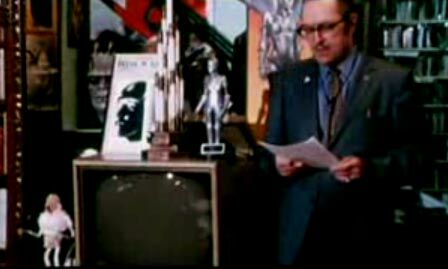 Uncle Forry, thanks, it's been fifty years since my first FM, and five or six meetings with you at conventions and such...and I assure you that you're not just another picture on my wall. Your passing is sad but gain satifaction in knowing that you will not be forgotten. 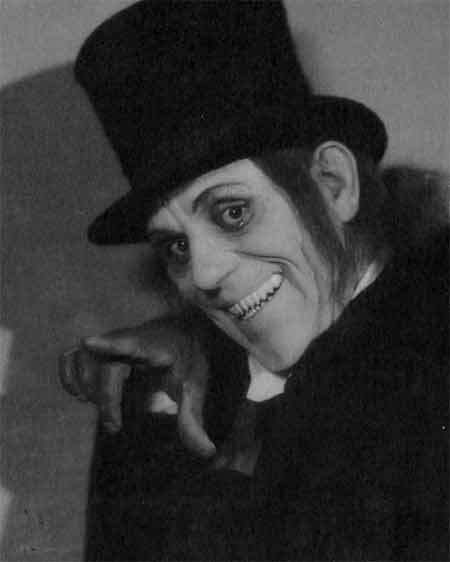 were sitting by Themselves eating cake in full costume as The Phantom of The Opera from Man Of A Thousand Faces and The Frankenstein Monster ala Karloff ! So , I asked If They would do me a favor and get up next to Forry and The rest is history! Again It seemed like hundreds of cameras were clicking away! 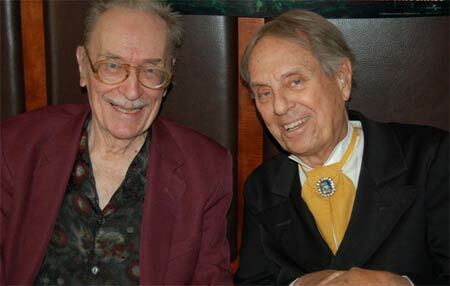 Well Ron , It was and is an honor and a privelege to say I was able to contribute in some small way to The legend that is Forrest J. Ackerman. He will be missed!! Take care , Be well , keep in touch and have a great Holiday! 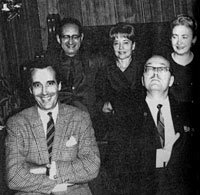 Above: Lifelong friends since teenagers - Forry Ackerman, Ray Harryhausen, and Ray Bradbury. The above appearance at the 2005 ComicCon. I had the privilege of meeting Forry a few times over the years. I spoke to him once over the phone, and I will never forget him. 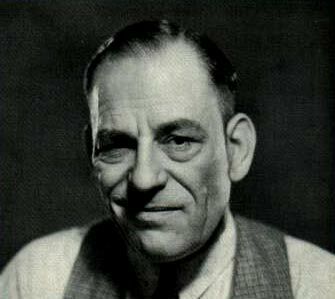 I imagine, in the afterlife, Lon Chaney walking up to Forry and saying..."So......YOU'RE the one....."
I was so sorry to hear about Forry's passing. I thought of you and your family immediately and wanted to express my sympathy to you all. I'm sure Forry was like a member of your family and you're feeling the loss more profoundly than most. I know that your memories of a kind and gracious man will see you through. Above: Forry as Dr. Acula and, right, Richard Sheffield with Dr..acula. I was so fortunate to have been able to spend some time with Forry during my trip last June to Los Angeles. On that occasion I gave him his copy of Jim's MftV-German Robles issue which German had dedicated to Forry. Robles had always wanted to meet Forry….but wasn't to be. RIP 4e, my friend of 58 years. With Forry's passing it seems in my mind that both of you have inherited the keys to the kingdom. You're now the leaders in keeping the Love alive, not that anyone could replace Forry (just as no one can replace John Lennon, George Harrison...or Santa Claus, seriously). Having said that, please let me express my heartfelt gratitude and appreciation for all you've done for Monsterland. I am looking forward to your respective tributes to Forry though. 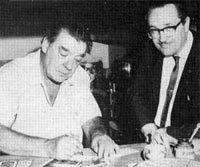 I'm sure both of you have projects in motion as we speak, but I think it would be a great idea if the 2 of you collaborated on a book/magazine celebrating the life of Forry Ackerman. All things aside, I will continue to support both of you whenever and however I can. 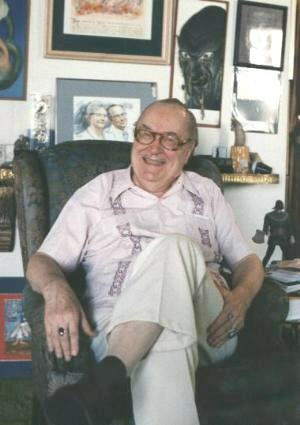 Hi Paul, no one can replace Forrest J Ackerman. 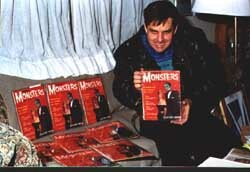 He was there, before the Internet....bringing us together through the premier monster magazine (along with presentation by Jim Warren). Dennis is planning a BIG Forry Tribute in his SCARY MONSTERS #70 magazine. I'll also be doing something in the next issue of Monster Bash magazine. For the Monster Bash Conference, I came up with the only thing I think would be truly fitting...something VERY, VERY special that will happen at 11:58PM on Saturday night at this year's Monster Bash Conference. 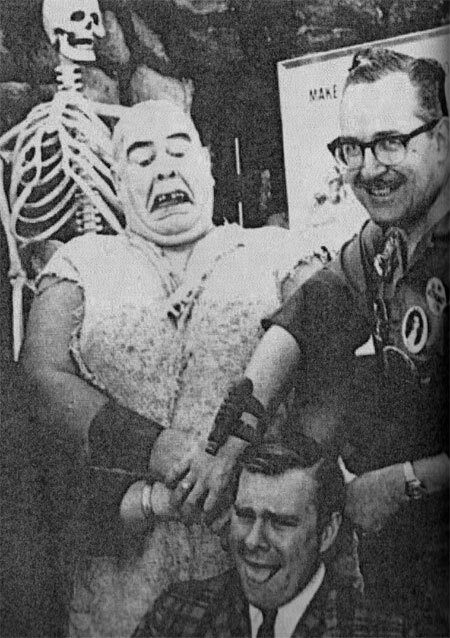 It involves the entire Monster Bash staff (myself, Dennis, Bob Pellegrino, Ursula...the whole staff)....and all attendees. Hopefully, we'll create a little magic in the air with Forry. So, look for Scary Monsters Magazine #70 (I believe due out in March) and we'll see you at Monster Bash June 26-28, 2009 in Pennsylvania...(CLICK here for details at Bash). Above: Photos from Rocky Thein. After seeing all of the tributes to Uncle Forry I wanted to send you some of the photos from my visit with him at his home in 1989. Back in 1969 (when I was 17) I wrote him a letter and mentioned I would like to visit him some day in California when I became rich enough to travel that far from Iowa. To my surprise he sent me a postcard that said I better hurry up and not wait. Finally in 1989 I rode my Harley out to see him and it was "FANTASTIC". I showed Forry the 20 year old postcard he sent me and then I had him autograph one of his paperback books I had brought along to acknowledge my visit. It's been another 20 years and as I look at these pictures I realize I was one lucky guy! Thanks for posting Forry's address a month ago. I was glad to get the chance to send him one last note. 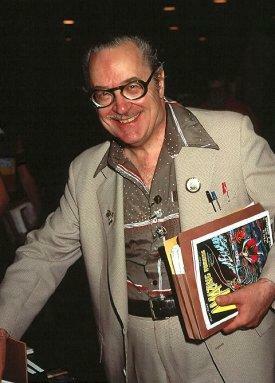 I was fortunate to have first met Forry in Toronto at the World Sci-Fi Con in 1973 & kept in touch on & off ever since. 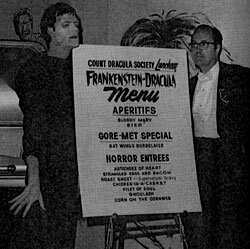 He helped with my cookbook project & my biggest thrill was appearing in 3 different Famous Monsters mags in the early 1970's-(letters & stuff-Peter Cushing interview)-thanks to Forry! 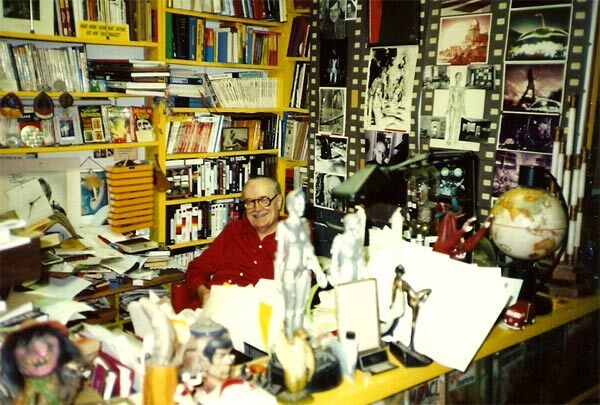 Yes Forry Ackerman was a wonderful man who always had time for us & will never be forgotten! & God Bless Beverly Garland (what a sweet, kind lady) & Nina Foch! Whats this name on the cover? 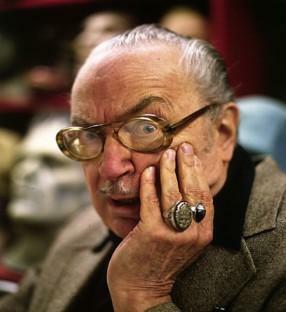 Forrest J. Ackerman? Soldiers, Moms and Dads pray to God for saving. Thank you for being our heart. final visit with Forrest’s namesake, February 2008. Above: Forry with a repro of his fantastic catalyst....AMAZING STORIES pulp magazine.....amazing....Forries. 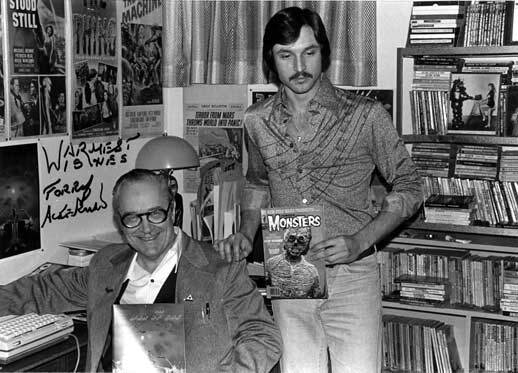 I grew up with Famous Monsters, with Mr. Ackermonster and all of his "Ackernims", but my favorite memory was meeting him at Bash. After saying hello and introducing myself, it was like we had been friends for years, what a gentlemonster!! 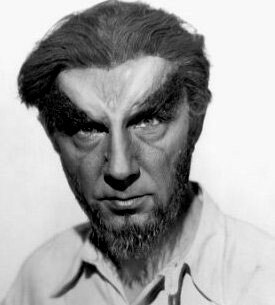 As busy as he was, I asked him if he would look at my Bela Lugosi autograph and give me his opinion. He said he would be glad to, and said I a "real" one. In closing I have to say he is having a great time talking to all the other "Greats" who have gone before him. I knew that Forry was quite ill. When I hesitantly went into the news section of your site a few days ago, I unfortunately found what I was hoping might not be there; a part of Forry had left us--but not his spirit. In his senior English class, my son has been reading Emile Zola's novel, Germinal, which concerns itself with the plight of nineteenth century miners in France. 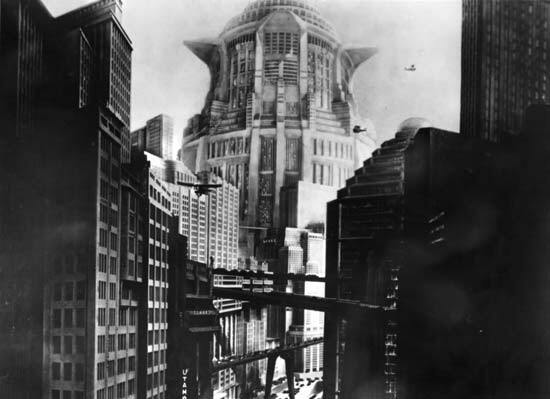 Just the other day, an exciting thought came to me: "Michael, we have to watch Metropolis (which he'd never seen)--the film and its theme would perfectly complement Zola's novel, and maybe stimulate further class discussion!" When I think back on that moment, I wonder, was that really me talking, or was it was really Forry speaking, continuing to remind his "pupils," young and old alike, about the wonders of the fantastic cinema. Dr. Acula, you've been one of the greatest professors I've ever had. 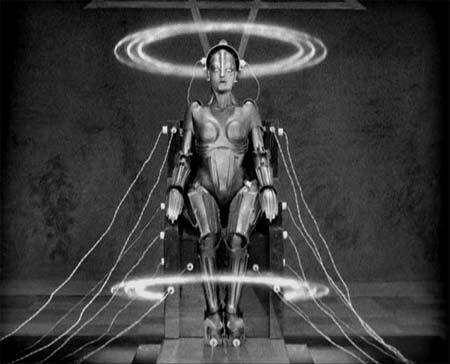 I'm sure you'll be peaking in when Rotwang's robot appears on the screen in Maine later this week. P. S. A photo of father and son (wearing a vintage 60's mask for Halloween) bonding in a friend's laboratory--definitely another Ackerman-inspired moment! (See above photo right). ...and here's a GREAT music video sent in by Vince Rotolo -- CLICK HERE! 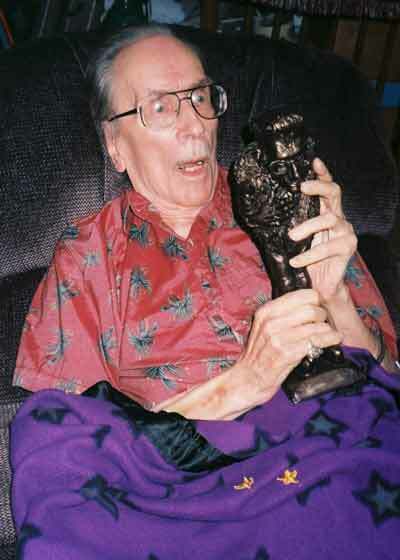 Forry with his MONSTER BASH AWARD (The Forry)...it was the very first one given out...to none other than the Ackermonster himself...naturally. Photo from Terry Pace. 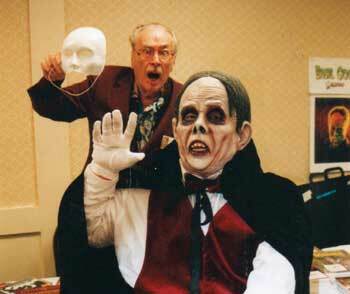 It took a while to form my thoughts on the passing of Forrest J. Ackerman. He played such a large part on my childhood. What he imparted to me has carried over into my adulthood. I grew up in the small town of Grayslake, Il. Its 40 miles north of Chicago. It was the early 70s and Saturday was the brass ring of the merry-go-round week. I grabbed it with both hands every week. I couldnt wait to go uptown with my brother. I spent part of my allowance at the five and dime store buying Sixlets, Smarties, Sweettarts, and other assorted sticks of dental dynamite. 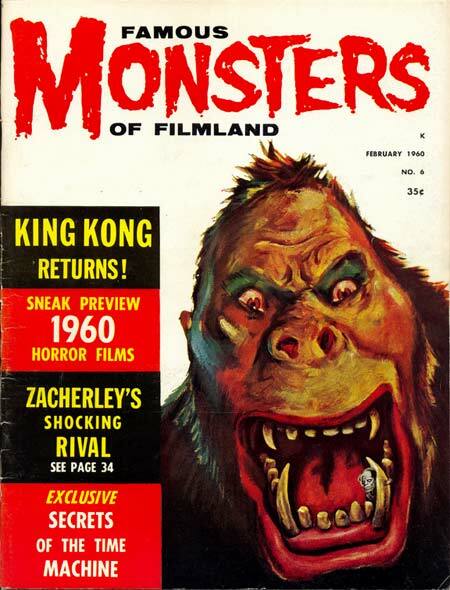 The other part of the allowance would go to horror movie magazines specifically Famous Monsters of Filmland. 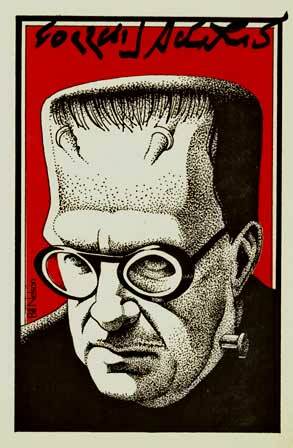 I would read the other magazines, but Famous Monsters was the Cadillac among the Pintos. 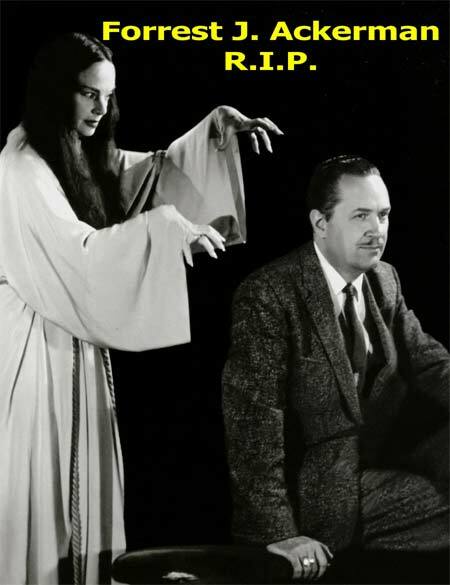 All the magazines paid reverance to Karloff, Lugosi, and Chaney(both). 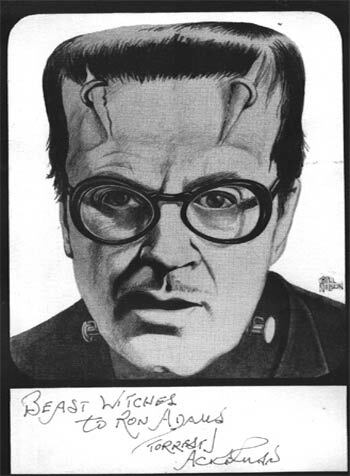 Famous Monsters were the only ones who bought up Jack Pierce, John P. Fulton, and Willis OBrien. When I had my Famous Monsters, I had ammunition for the onslaught that night. 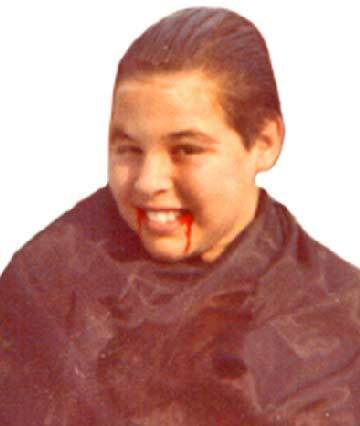 At 8 pm channel 7(WLS-TV) would show Freaky Films. They dealt mostly with Hammer films with the occasional Godzilla movie thrown in. The real threat to my impressionable young mind, however, was Creature Features at 10:30 pm channel 9(WGN-TV). They didnt have a host to try to diffuse the fear of the viewer. 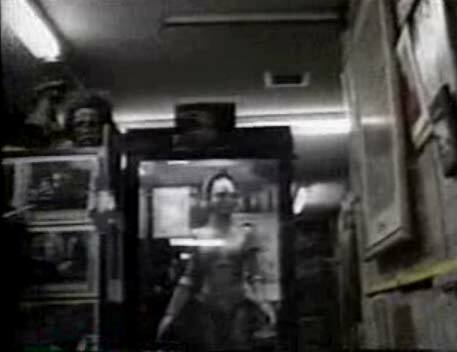 They showed clips from Universal horror movies while Henry Mancinis Experiment In Terror played in the background. These were the movies that scared me. Mr. Ackermans corny captions under the wonderful pictures cut through the fear and settled into the wonder. The wonder of the performance, the wonder of the artistry, and the wonder of the film. 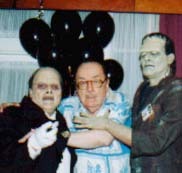 Long before I knew they were friends, my life was centered around Forrest Ackerman, Ray Bradbury, and Ray Harryhausen. They discovered a long time ago that the fountain of youth flows from the brain and onto the canvas(magazine, book, and film). From the canvas it flows to the viewer. 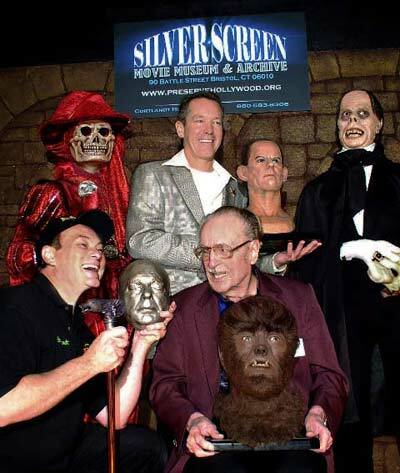 I had the pleasure of attending the 1998 Monster Bash. 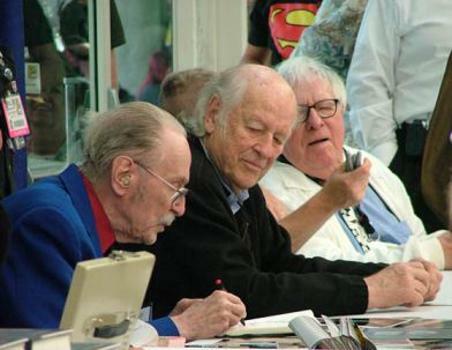 The main guest was Ray Harryhausen. 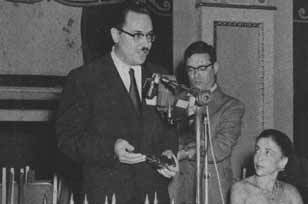 Forrest Ackerman was there as well. What struck me, while I was standing in line, was the diversity of people. On the outside, we were young and old. We had long or short hair. We had different ethnic origins. On the inside, we were all twelve years old. We were waiting breathlessly to talk to Mr. Ackerman, The King Of The Twelve Year Olds. then!) He then signed it. wonder what was tacked to my ceiling! 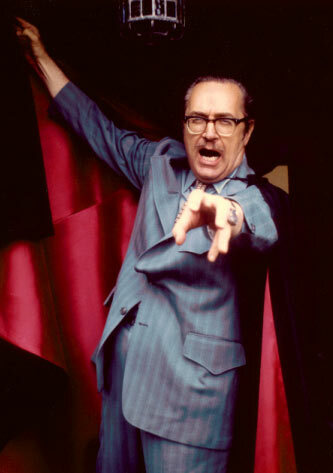 of Forrest Ackerman, that I'd like to share with Creepy Classics fans. 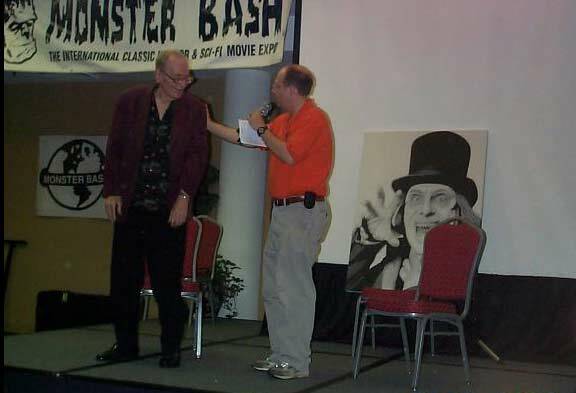 Super-fan and monster artist Malcolm Gittens sent in this photo of him with our beloved Ackermonster at one of the Monster Bash conferences. pose at my desk with a copy of SPFX #1. 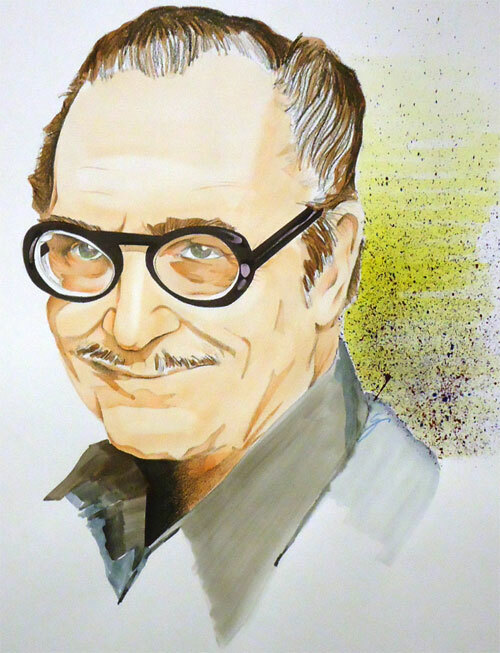 I just received this great painting by John Sargent of Forrest J Ackerman! What a super rendering....catchinmg the warmth, knowledge and relaxed excitement that was Forry. Thank you , John, for sharing your nice piece. 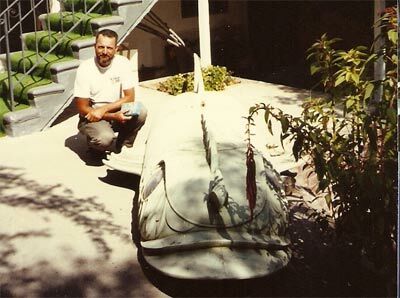 Add your comments, memories of Uncle Forry, and images by e-mailing creepyclassics@creepyclassics.com! Just CLICK HERE!